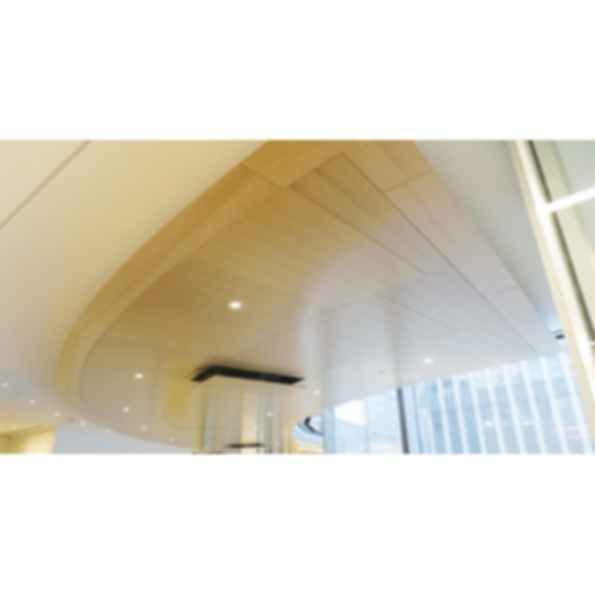 Add the warmth of wood with Decoustics' Fori natural wood veneered acoustical ceiling and wall panels. Fori is designed to provide the aesthetics of a solid wood panel with the acoustic properties of a perforated panel. When viewed from a distance, the mini perforations virtually disappear giving the appearance of a monolithic wood ceiling or wall installation. Fori panels are available in a variety of natural wood veneers, custom stains and paint finishes. Manufactured to custom sizes with the option of unique shapes, Fori panels can be designed to complement any space. For added flexibility in your design, Fori panels can integrate into most of Decoustics' ceiling suspension systems, including Decoustics' 100% downwardly accessible Ceilencio® system. All Fori products are manufactured for a precise fit, delivered on site fully finished and ready for installation.